Do you dream of having a space that is just yours, no one else can place their junk on, and you can make pretty? Well, I have been dreaming of that forever! I have never had a place in the house where I could sit and put my make up on, do my hair or hang my jewellery. Until now! That’s all mine now! I’m not going to let anyone fill it with junk or kids stuff!! I can now store all my makeup, hair bits and bobs, creams, nail polishes and all those little bits and bobs. I have made us of the alcove of the bedroom to fill with more storage boxes. 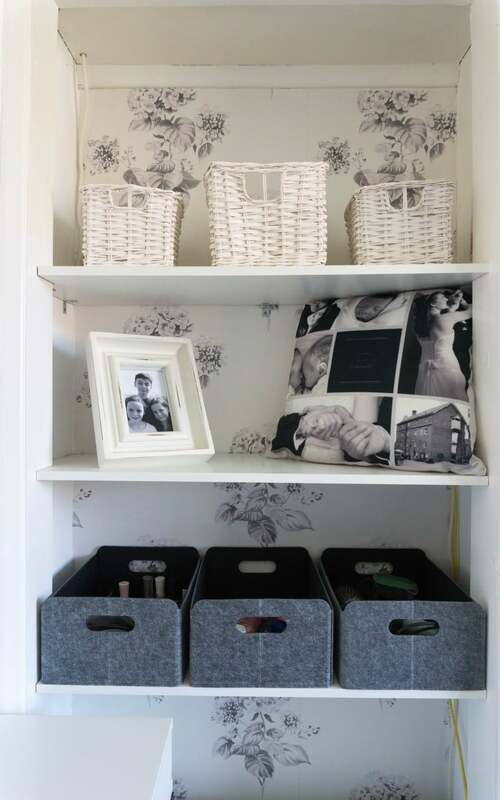 The grey IKEA BESTA storage boxes are perfect for this shelf, I then can fill with all the little bits and bobs! Being an open top I can easily reach things, and plug sockets near here it is easy to dry my hair too. Even my Photobox cushions work well on the shelf! Of course, you have spotted this amazing mirror! I was sent this Hetti Round Mirror from Exclusive Mirrors to try to find a perfect space for it, I think I managed that! It looks perfect here, with a real impact, and gives me plenty of mirror to get ready in front of. 100cm in size it makes a statement! I have always wanted one of these sunburst mirrors, and this one really doesn’t disappoint. It works perfectly in a silver finish, with my grey and white colour scheme. I love that I was able to still place my little photos around the shape of this mirror too. We love IKEA, and I love being able to turn them into something more than there come as. 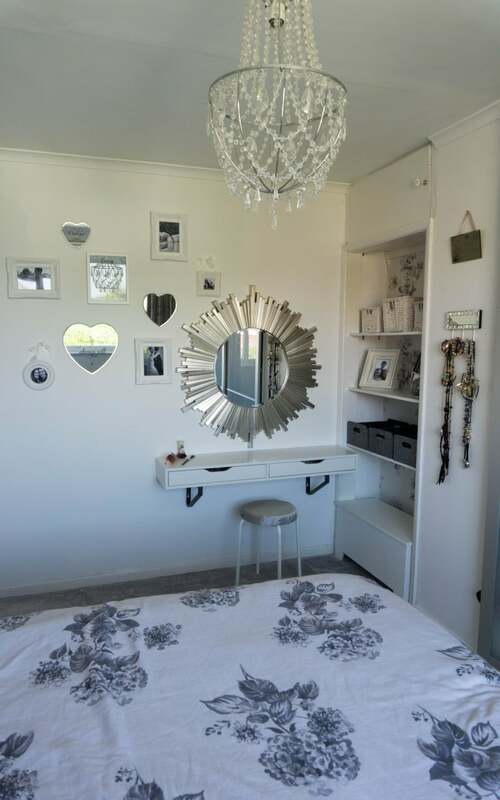 The IKEA EKBY ALEX shelf was used as the dressing table, with EKBY LERBERG brackets in grey as support. This pulls out the grey within the wallpaper, flooring and bedding too. The shelf has some really nice drawers to place items inside, you can purchase inserts to stop things moving around so much. Have you spotted the little stool? 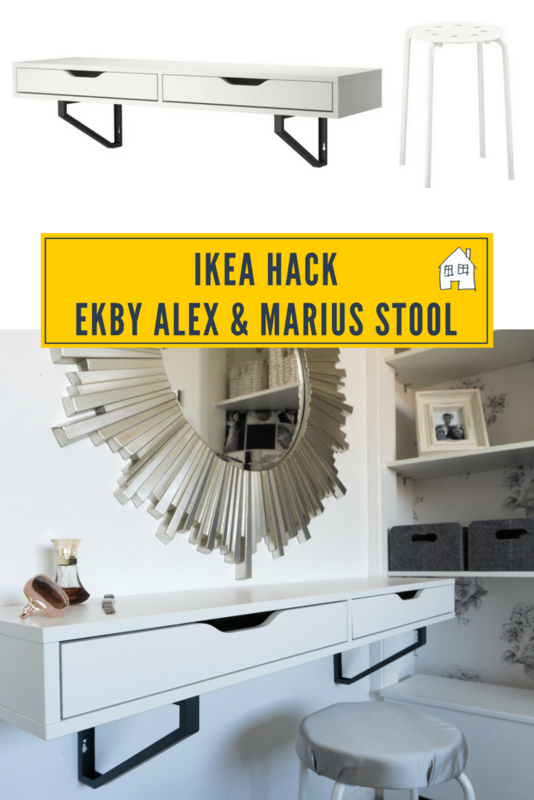 This IKEA MARIUS cost £3 from IKEA but looked cheap (as it would be for £3!) so I wanted to add something extra to it. I purchased some off the roll fabric from Dunelm Mill, but you could use anything that matches your decor. You don’t need very much at all. A piece of foam, and used a glue gun to glue it all together. Then that was it! Now it’s comfy and much prettier, and so easy to do. I am so pleased with my new dressing area, I can now sit peacefully with a mirror in front of me and get ready. Bliss! So what do you think of my new dressing area? 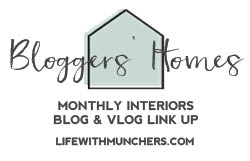 Have you got a space that is just yours? Hope you’ve managed to keep it clear of everyone else’s junk!! *Post Contains affiliate links * I was sent the mirror for the purpose of this post, however, all opinions are honest and of my own. 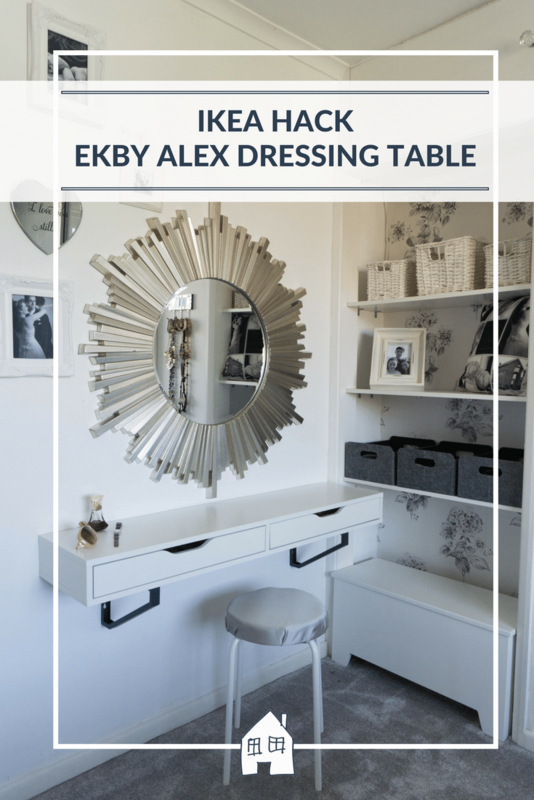 i had a question about the ekby alex drawers, what are the measurements of the drawers length x width ? They measure 119x29cm, theres a link in the blog post if you want to find out more about them. This is so clever.. I love what you have done. Great for small spaces@! Such a nifty idea isn’t it, the drawers hold quite a bit too, so you can store quite a lot of your bits and bobs! Thank you, I had a good clear out of all my bits and bobs, never end up using them all anyway! Thank you, I find the colour scheme so calming for my bedroom. Thank you, I find it so calming in our room. Now have to keep it clutter free…! Yeah it’s a great space saving idea isn’t it, hopefully you can find a space for it! 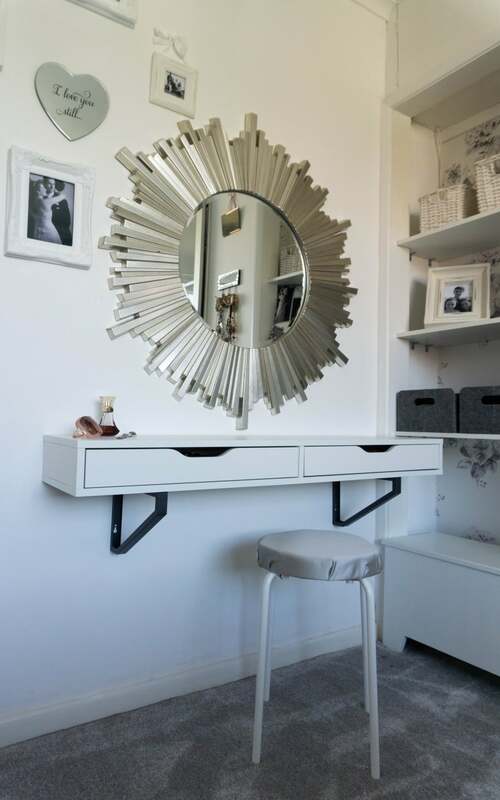 Great use of the space, enjoy your dressing table! Thanks! I will be for sure!! I love the mirror on the wall. So pretty. I have a similar one here. Glad it inspired you, and I hope you can create a little space just for you too. What a lovely space you’ve created. I would love an area like that, one day maybe. It’s been hard enough trying to get an area to work in without it being rammed full of other peoples things! 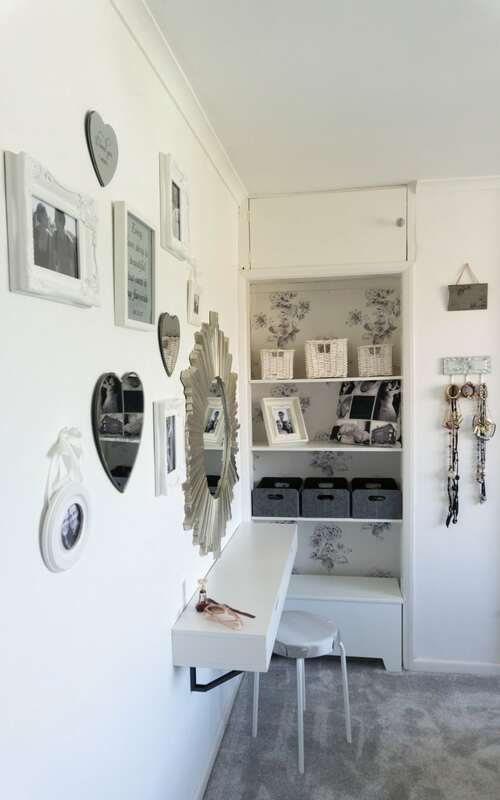 I have managed to squeeze a couple of spaces like this, I think it makes such a difference having a space for you, and to keep everything organised. Thank you, so useful to keep everything in once place now! Lets hope it stays that way……! What a fab space saving idea!! I love it, and it looks so stylish too! I would love to do something like this in our room but I lack all motivation! One day…! Mines taken 11 years until I have finally got my own little space! Wha a beautiful space. I never thought about a dressing table without legs. Great idea. Thanks, yes it doesn’t look so cheap now and nice and comfy to sit on too! Love the hack and loving your special nook it looks gorgeous love the way you have created a feature with the mirror gorgeous! Thanks! Now I can fill it with lots of little bits and bobs! Sucha simple but clever idea. That mirror is beautiful. Love the round shade mirroring the shape of the stool and the silver accent. Thank you, the mirror is amazing isn’t it! That dresser is lovely. My wife is always on about how much she wants to have one so I’ll show her this post! I’m sure she will like it! this looks lovely, really like the style of it all. And the mirror is super stunning too. I’d love a dressing table area – may one day! Maybe one day, it has taken me 15 yrs!! Thank you, just have to make sure I make the most of it now! I’m sticking to this now, and I’m going to have a place of mine all the time now! Great hack, love how neat it looks. I’m lacking in space and would love a dressing table. Thank you, I love having everything in one place now and not having to hunt for everything!